The giant monolith of western Sydney’s Bankwest Stadium is almost ready for the crowds as it nears completion. The final touches are being made to the $360 million stadium which is scheduled to open Easter Monday weekend. Bankwest Stadium has about 80 per cent of the 30,000 seats in place, the viewing room is ready and 4300 tonnes of steel has been used to form the seating bowl and roof; all that is missing are the teams and fans. 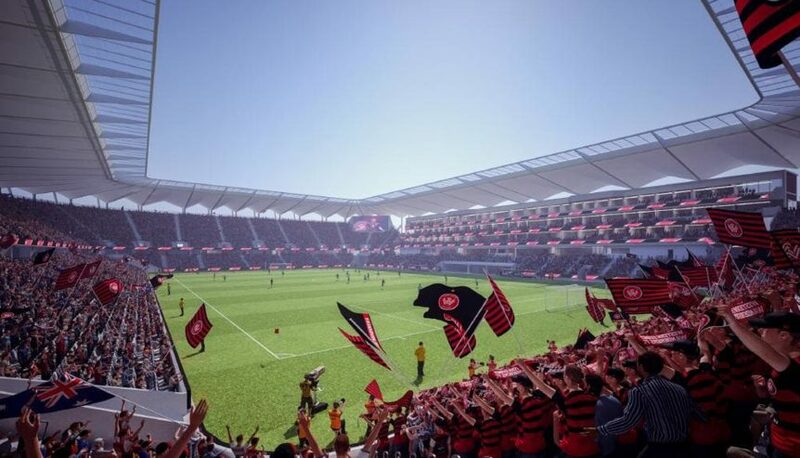 An artist impression of the Bankwest Stadium, Parramatta, which will host the home games for the Parramatta Eels and Western Sydney Wanderers. It will also have a viewing room for fans. The stadium will be the first on the east coast to have a viewing room, with Perth Stadium the only other one in the country allowing for a rare look in. The stadium design is also intended to enhance crowd experience, with the seats positioned at 33.9 degrees; making it the steepest in the country. Installation of the high-tech playing surface system is underway with the delivery and installation turf scheduled for March, well before the Eels face the Tigers on April 22.